After Twitter announced some tough new rules for third-party developers last week, it remains unclear precisely what those changes might mean for the future of your favorite third-party Twitter client. While the rule changes don’t ban third-party Twitter apps outright, they do set forth tough caps on any new such clients, which must max out at 100,000 users unless they receive special permission from Twitter. Existing apps can continue to function, and instead face a cap of precisely double their current user bases as of last week. Other new policies Twitter outlined include sharper limits on what functionality apps can offer, how tweets must be displayed, and what actions can be linked to those tweets. 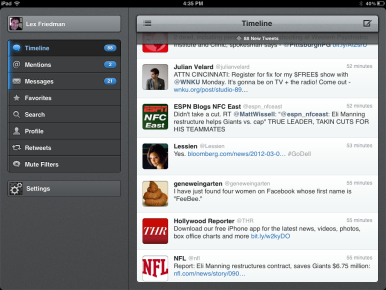 Macworld has spoken with several developers behind third-party Twitter apps—or at least, we’ve tried. Some developers are notably hesitant to speak on the record, lest they incur Twitter’s wrath; the fear seems to be that since Twitter is now exerting more control than ever over access to its API—which developers leverage to make their Twitter apps work—that irking Twitter too much might result in a developer’s API access getting revoked. We also contacted Twitter for this article; the company has not responded. It’s possible that Twitter’s developer crackdown will be a boon to upstart competitors like App.net, a paid service that aims to offer a microblogging platform free from advertisements and developer limitations of the sort that Twitter has put forth. But should Twitter devotees who use and enjoy existing third-party clients be concerned that their favorite apps will be forced to shutter their virtual doors? Some users are concerned that the artificial growth limits now mandated by Twitter could mean that companies like The Iconfactory might, by necessity, stop supporting their apps in the long term; it could be hard to justify investing further time and funds into innovating and improving apps that now face limits on just how many people they can reach. Paul Haddad is the lead developer for Tapbots, the company behind the popular Tweetbot app. 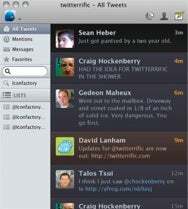 In a blog post titled “Don’t Panic,” he wrote that “Tweetbot for Mac is coming out soon, Tweetbot for iOS isn’t going anywhere.” As with The Iconfactory, Haddad writes that Tweetbot’s user cap number is “pretty huge,” and that he expects it will be “a few years” until the company hits that wall. He adds that “all our current users will be fine” even if the company eventually hits its cap. Of course, if Twitter makes significant changes to its API that require heavy development work, companies like Tapbots may find it harder to justify the costs involved in issuing the needed updates to a maxed-out user base, unless they resort to options like in-app purchases to pay for the new development that would previously have been supported by new users. Haddad makes passing reference to Twitter’s new display requirements for third-party apps, writing that Tapbots will “be working with Twitter over the next six months to make sure we comply.” What changes Twitter may require of the app aren’t yet known. But Haddad promises that “the beta of Tweetbot for Mac will be coming soon, shortly followed by the final release in the Mac App Store. All three versions of Tweetbot [iPad, iPhone, and Mac] are based on the same low level code base, so once [the Mac App Store version is] out, we expect to continue to add new and exciting features to all three apps.” Regarding App.net, Haddad told Macworld: “We plan to keep an eye on it, but haven’t made any firm plans” thus far. “We were there at the beginning and we’re going to ride this wave out,” Stone added. Explaining his optimism, the developer referenced existing developers’ ability to double their user bases, and highlighting the fact that “Twitter left the door open” for developers by saying that, once they hit their user caps, they would need explicit permission from the company. That’s better than saying that once you hit the cap, you’re entirely out of luck—though Twitter hasn’t said under what circumstances, if any, it would grant third-party developers increases in those user caps. So far, though, Twitter isn’t saying.